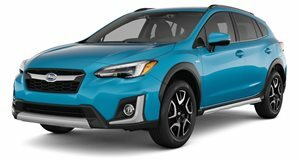 The Subaru Crosstrek Hybrid is a new addition to the second-generation Crosstrek range introduced in 2018 and features a 2.0-liter flat-four gasoline engine assisted by a Toyota-sourced electric motor and battery pack. Combined power output is 148 horsepower, curiously 4 hp down on the gas-only model but performance is claimed to be better. It still lags behind most rivals in acceleration and the short 17-mile all-electric range and EPA rated 35-mpg combined consumption figure are also below average. A comfortable ride, standard all-wheel-drive and high-ground clearance aid its off-road prowess, and the interior is one of the more spacious in its class despite cargo space coming up a bit short. The Hybrid model comes well-equipped, offered with the Limited trim package as standard which includes the EyeSight Driver Assist package as well as leather interior and 8-inch infotainment system. Prices start at $34,995.